Opening Worship at Annual Conference kicked off at 10:30 AM at Stuart Auditorium at Lake Junaluska Conference and Retreat Center. You can check out the service order on pp. 2-6 in the 2018 Worship Book. 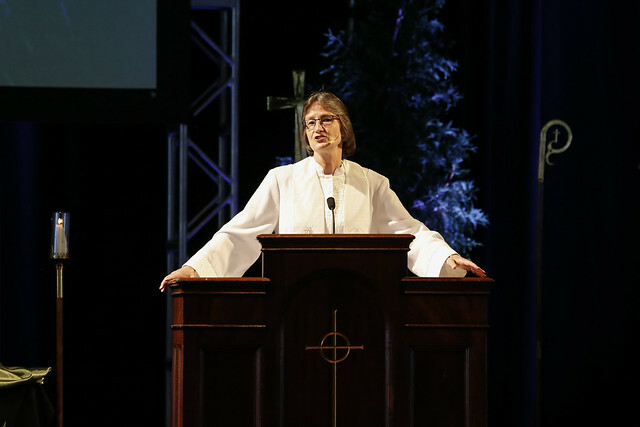 Bishop Sandra Steiner Ball offered her sermon- "Go and Teach" using the texts Matthew 28:16-20 and 1 Timothy 3:14-16. After the sermon we heard from Dr. Phyllis Worthy Dawkins, president of Bennett College in Greensboro, NC. The offering for the service was scheduled to go support the work of the Bennett College that serves the young women of this United Methodist institution. The communion service that followed the offering included district superintendents, conference staff, and the deacons of the conference as servers.